The Suimeikai, one of the representative events of the Pontocho Kabukai Association, was first held on March 15, 1930. 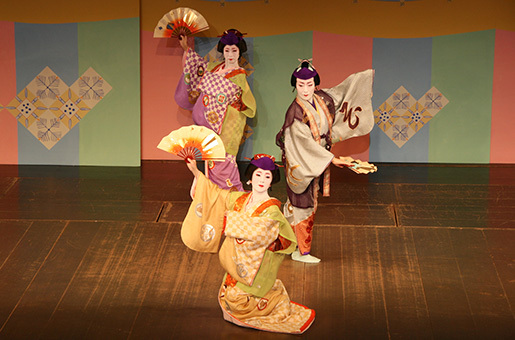 It’s a developmental consolidation of the “Nagauta Chiyosakaekai ” (first held Feb 1907) and the “Saturday Meeting” (first held Sept 1927), which were held before as part of the kabuki research association. It was named “Suimeikai” after the clear waters of the Kamogawa River. At the time, it was compromised only of geisha who had an abundance of talent beyond the special basics. The performances were held regularly every March, June, and October until the 36th performance in October 1941. During this time, a special season pass was issued, which allowed customers to view the performances year-round with just one ticket. The performance returned after the war in September 1949, and was held twice a year in March and September until 1953. Afterwards, the performance was held once a year in the afternoon and at night, but from 1999 following the abolition of the “Fall Kamogawa Odori,” the performance that had been held in March was moved to October.